Clyde Muirshiel has a wealth of history within its 108 square miles including Castle Semple, the Barytes mine, Greenock Cut and much more! The Semple Trail Heritage Project 2016 resulted in several of the historic structures within the Castle Semple Estate being restored and being made accessible. These include the impressive cascade complex and its adjacent ice house and cave. View the octagonal Temple from the foot of Kenmure Hill and discover the grotto which rests within Parkhill’s woodland. The nearby Category A listed Collegiate Church dates back to the early 16th century. It is a late gothic church, built in 1504 by John, 1st Lord Sempill. Although there is no roof, the church is well maintained by Historic Scotland. 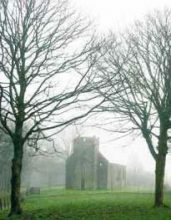 The church can be visited at any time and is located 2km from Castle Semple Visitor Centre, at the east end of Parkhill Wood not far from the cycle track. More information is available onsite or online in the link above. 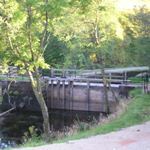 A Scheduled Monument, the Cut was built under the supervision of civil engineer Robert Thom in the 1820s to supply water from Loch Thom to Greenock. This supplied the growing number of mills and waterwheel powered factories, fueling the industrial revolution in Greenock. A by-product was a source of clean drinking water for the local towns folk. It was used as a water source until 1971. Heritage Lottery Funding restored and upgraded the footpath in 2007. The Cut as a 8km walk is rated as one of the top 50 walks in Scotland. Inside the Greenock Cut Visitor Centre there is an informative exhibition on the history and culture. Scotland’s Rural Past website has some good information on the history of local farms here. Was once an impressive grouse shooting estate, frequented by Winston Churchill. The current Visitor Centre is located on the site of the original mansion house. Not far from Muirshiel are the remains of the old grouse railway and the site of the Muirshiel Barytes Mine. Muirshiel, was the first local authority designated Country Park in Scotland, designated in 1971. Muirshiel also provides a good access point to some of the aircraft crash sites (1938-58) in the Regional Park. There is a fantastic film of ‘Renfrewshire Regional Park‘ covering Castle Semple and Muirshiel Country Parks in 1972 on the National Library for Scotland’s Moving Image Archive.